Here's one which promises to be unusual. At BevMo, we found Journey Caribbean Creme. As a fan of cream sodas, I felt I should give this a try. The label describes it as "Hint of coconut, gentle brew of Java vanilla." Sounds interesting. My interest is further piqued by the fact that the bottler's logo, prominently featured around the bottle, is an upside-down, mirror-reversed question mark. And I note that this bottle has more of those coded dots down near the bottom! More on this topic in a further post. This soda comes with an additional side effect. Since reading the name (Caribbean Creme), I have had Billy Ocean's song "Caribbean Queen" stuck in my head. Scent: Wow. Strong vanilla, but mixed with coconut and (maybe) coffee. The lead assistant tester says it smells like buttered kettle popcorn, and he's exactly right. The Lead Assistant Tester says: "I wonder if it tastes like that. I hope not." It's not a bad smell, exactly, just very strong and not what I would expect. Taste: Interesting. More sour than it smells, but pretty similar. Really quite unique, not like any soda I've had. Sweet, with a strong undertone of vanilla, overlaid with coconut and popcorn, with a hint of coffee. Opinions in the Lab vary rather a lot. Lead Assistant Tester: (retching noises) "Nobody should ever drink this", making panting noises with his tongue out. Kibbitzer-in-Chief: "I have goosebumps of horror. 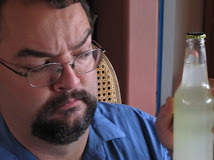 I'd rather drink the Kombucha Wonder Drink"
Junior Assistant Tester, after at least 20 seconds of careful consideration, with a very serious expression: "I like it". Lead Assistant: "This should be on one of those TV shows, the 10 most disgusting things in soda"
K-I-C: "It tastes like a vermifuge. (does some net research) Look! Coconut oil is a vermifuge!" NOTE: a vermifuge is an anti-parasitical worm medication. Lead Assistant: "The worst thing about it is that if you burp afterwards, you can taste it again." I actually don't mind it, it's got character. Some Weird Sodas end up being slight variations on totally commonplace sodas, but not this one. This is not one of those. It has a unique and complex flavor, one I've never encountered before. Quaff rating: 2 and a half. Despite the fact that I kind of groove on the unique flavor, it is pretty startling. Cough rating: 3. Nearly caused upchucking in half the staff. And I think it slew my son. Get this stuff of my tongue. I haven't been able to get the Journey soda's up here in Mpls for at least 4 years. I actually really miss the Caribbean Creme a lot. Their entire line was incredibly uneven though. A couple were great, a few mediocre, and at least one or two pretty much undrinkable. If only their website were still up I'd be able to remember which was which. I used to blog more about soda but pretty much all of my regular posting of anything these days is on Twitter. Are any of you over there? Alas, none of us at WSR are twittering at this point. It's something I've been watching, but have not yet embraced. I could see how a person might become fond of this stuff. It's unique. Really excellent LEGO work at your website, by the way. Actually had my first bottle of this today, and thought is was quite wonderful. It was well balanced, not overly sweet, the coconut extract was subtle and complimentary to a rather complex vanilla. I just don't get the reviews above - maybe it's been improved since? I actually liked it well enough--not my favorite, but definitely interesting. The Kibbitzer-in-Chief generally doesn't like soda, and is particularly opposed to coconut. Thus, the review may be somewhat colored by her profound revulsion. The Lead Assistant Tester couldn't stand it either...but I'm glad you like it. It is, indeed, unique. Perhaps one's opinion about Journey Caribbean Creme could become part of a standard psychological personality inventory. Or a tool of political oppression. "Are you now, or have you ever been, fond of Journey Caribbean Creme?" I don't understand all the negative comments. This is the soda of choice for all members of my household (9). We have to order it online because I can no longer purchase it in Michigan. My kids call it butter beer because of the aroma. The aroma is one of its many appeals along with its unique flavor. It is the only soda I will drink. I do know several people that claim it is an acquired taste. I would give just about anything to order this locally again. I think this company went out of business over 5 years ago ... Where did you get this soda? No wonder is tasted gross! In it's day, it was an awesome creme soda! there is nothing Premium, rich and creamy, or traditional about sucralose. TRADEMARK INFRINGEMENT!! Surprised this business hasn't been issued a C&D order by Caribbean Crème, Inc. of St. Louis - or worse!